Bacalhau à Senhor Prior is a very traditional cod fish dish in Portuguese cuisine. It is a favorite of many in Northern Portugal as it enjoyed best during the cold evenings in the winter. 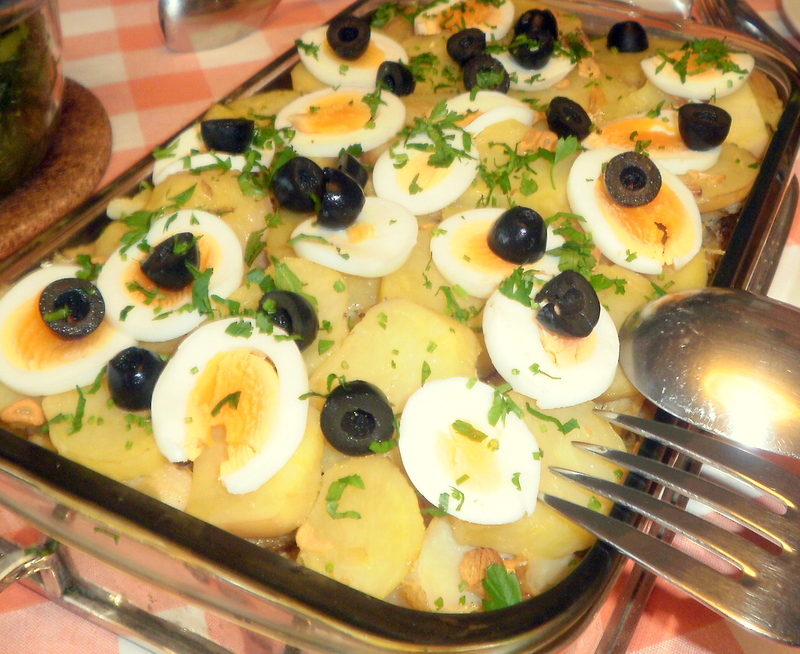 It is one of the more light bacalhau dishes and combines eggs, potatoes, olives and cod to make a hearty and richly flavorful dish that is always sure to impress. 1) For preparation, you must place the salted cod in a bowl of water for approximately three nights, changing the water every night until done. 2) Once the cod is ready to be cooked, place it in a saucepan with a cup of boiling water for 5 minutes. 3) Once done place the codfish in a bowl and break it up into small pieces. 4) Now cook the potatoes in a saucepan with boiling water until they are soft and well cooked. 5) While the potatoes are cooking boil two eggs in a saucepan with water until they are cooked through. 6) Once the potatoes are done, deskin and slice them. Slice the 2 boiled eggs into thin layers and set aside. 7) In a baking dish layer add the fish, potatoes, sliced onions, and garlic in an evenly distributed layer. 8) Beat the 4 eggs lightly in a bowl and spread over the dish. 8) Drizzle with olive oil, add salt and pepper to taste. 9) Preheat the oven to 385 degrees fahrenheit. 11) Place in the oven for about 25 minutes. 12) Once it is done, remove from the oven and decorate with the sliced boiled eggs and cilantro. Serve.